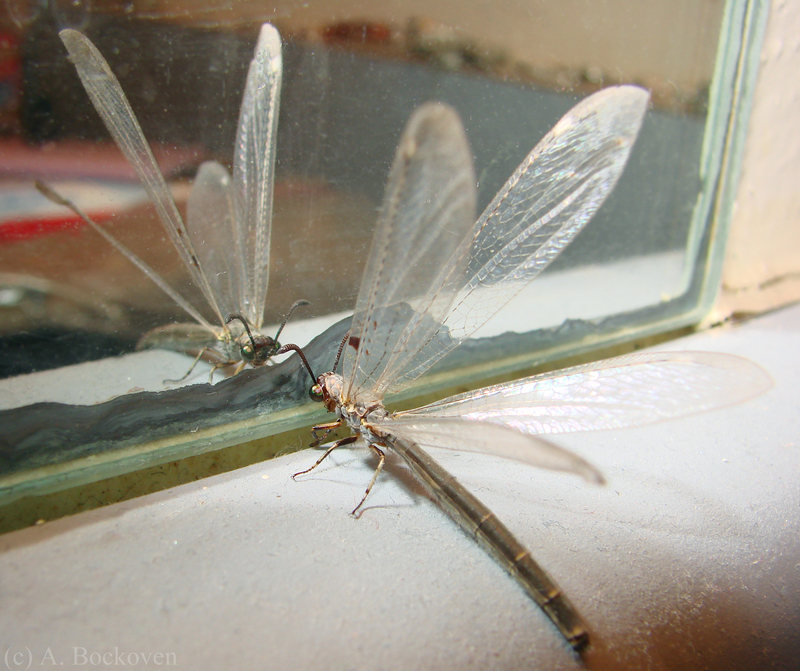 An antlion considering itself in a mirror. Ah, Texas summers. Heat like a broiling pot and air conditioning bills that could eat you alive. In honor of this lovely change of season (there’s a brief week where the nights still get below 80) I left my back door open the other night to help cool off the house. All sorts of wildlife too this as an invitation to drop by and say Hi. Aside from the the junebugs who spent the evening dive bombing my computer screen I saw a variety of nocturnal insects, including the charismatic fellow above. I found this adult antlion perched in my bathroom, apparently checking himself out in the mirror. I have seen exactly four of these locally in the past year, so apparently I should consider leaving my back door open more often. All the fun of collecting in the comfort of my own home! This wasn’t my most exciting visitor, however. The real fun was when I came by the back door to find my dog having a stare down with a large snake. Snake waiting outside the door. 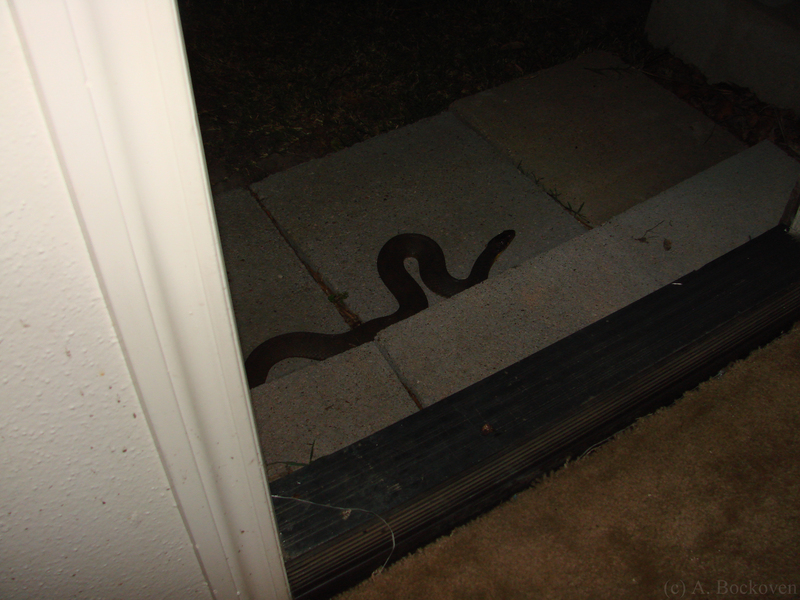 I don’t normally freak out over snakes (I spent a summer catching copperheads for a field project) but I also don’t normally find strange ones trying to enter my home. Turns out I find this kind of unnerving. Especially when the porch light is out and all I can see is a large dark shape. This leaves the ‘can it kill me?’ question wide open here in Texas. Of course, my first reaction was still to tell my dog to stay while I ran to grab the camera. Some instincts run deep. 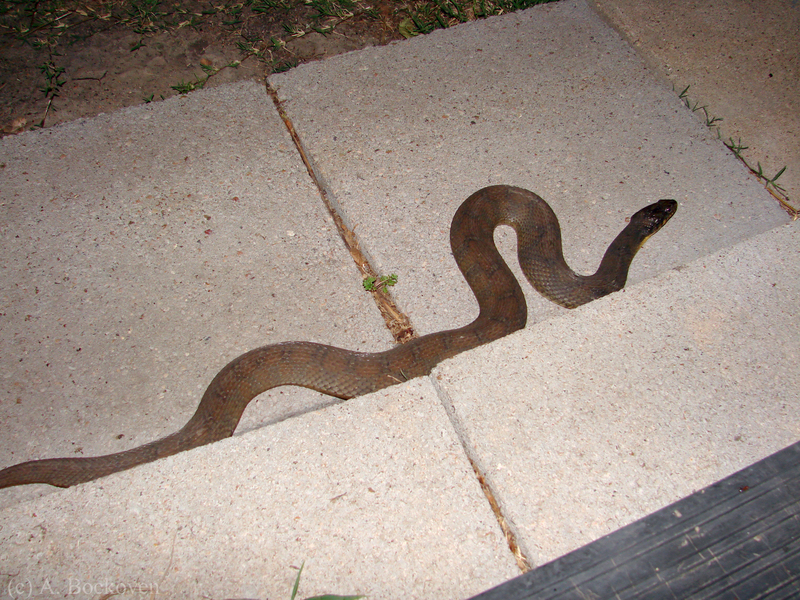 A water snake (Nerodia) chilling out on my back porch step. The flash had the added bonus of lighting up the patterning, revealing it to be a water snake. Mean tempered, but not venomous. Mom: What did you do with it? Me: I closed the door? One of my friends collected some spider egg cases at Lick Creek Park a few weeks back and was very surprised when instead of baby spiders the mantidfly seen above emerged. These little guys have some of the most fascinating life histories I’ve heard of. 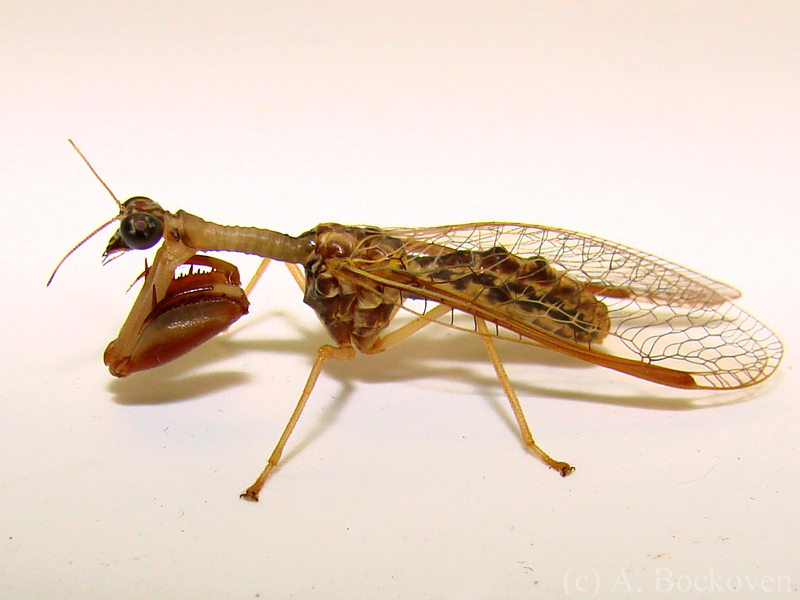 Adult mantidflies are predatory, catching small, size appropriate insects in their raptorial forelegs. 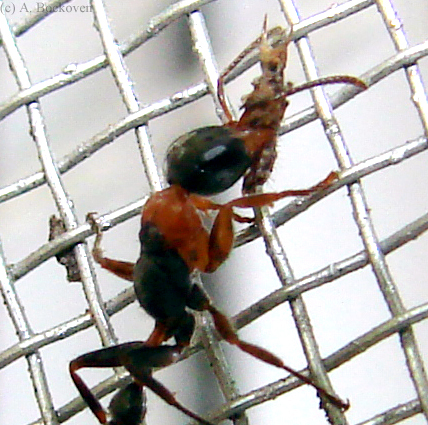 The larvae of various mantidfly species are generally either predators or parasitoids. Larvae of the Mantispinae sub-family employ a specially interesting strategy for predating spider eggs. 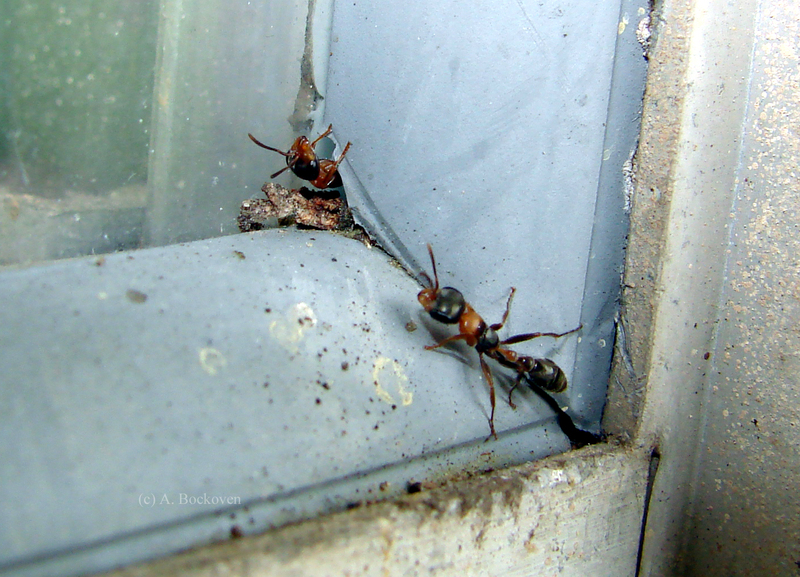 The first instar larvae are mobile, and seek out a spider egg sac to enter. Some species chew through the spider silk, but this is a tough material. Other species get around this trouble by hitching a ride on a female spider, and actually getting themselves spun into to the egg case as the spider lays her eggs. Once inside they spend the rest of their larval development safely ensconced, feeding on the spider eggs. They eventually pupate and emerge as the adult mantidfly seen above. A mantidfly strikes out with its raptorial forelegs. 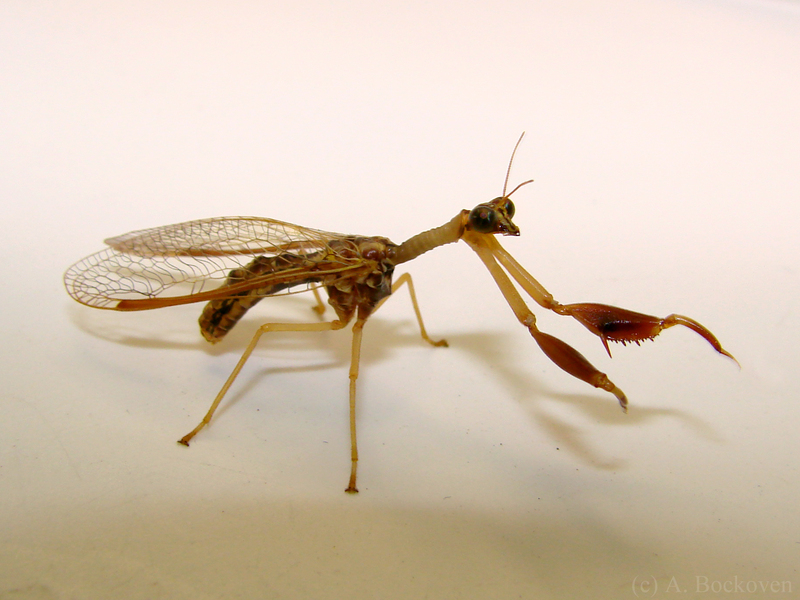 Mantidflies, also called mantispids, mantisflies and mantid lacewings, are not actually related to preying mantises. They belong to the family Mantispidae in the order Neuroptera, the net-winged insects such as lacewings and antlions. Their similarity to preying mantises is a striking example of convergent evolution–when unrelated organisms faced with a similar ecological challenge independently evolve a similar biological trait. Another good example of this is the case of dolphins and sharks with their similar streamlined bodies and fins, or even bats and birds with their wings for flight. Both preying mantises and mantidflies are predators, and their large raptorial forelegs give them a long reach and a firm hold for a quick snatching of prey. 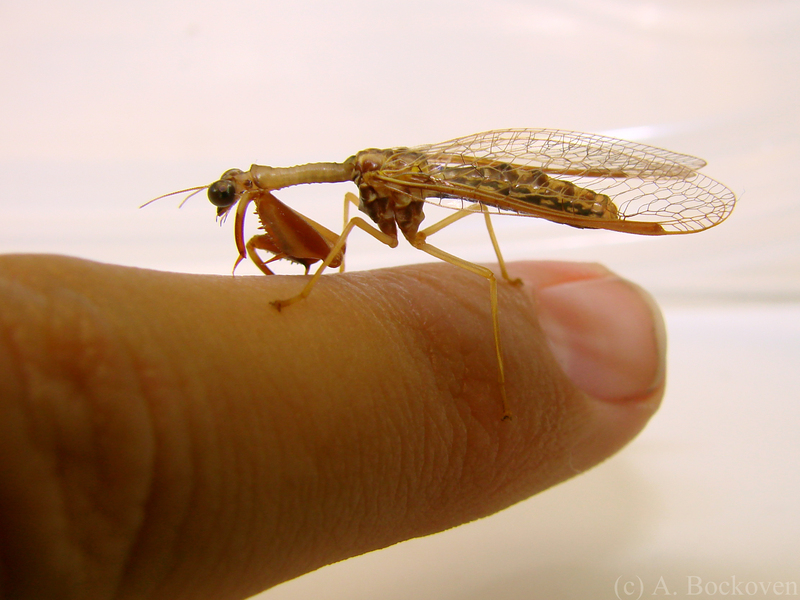 A mantidfly perches on a finger. 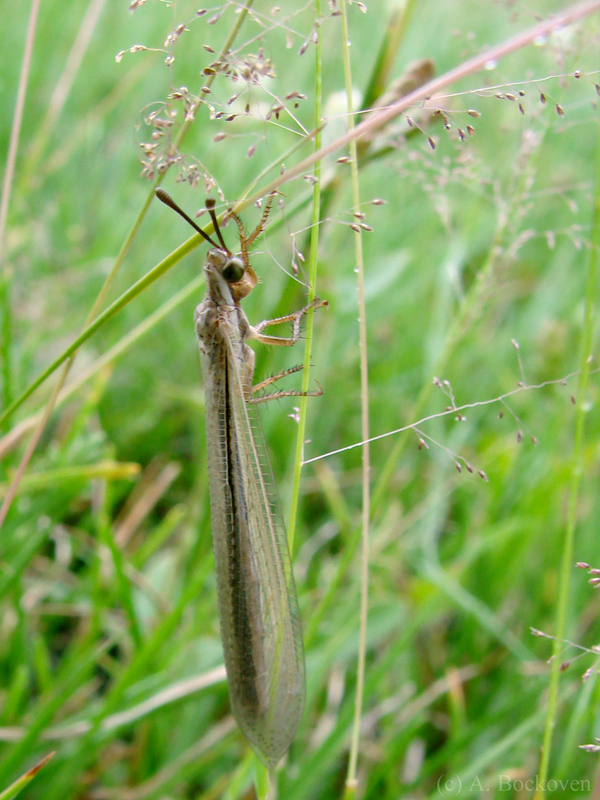 An adult antlion perches on a grass stem. Most people who have heard of antlions think immediately of little sandy pits with jaws lurking at the bottom of them. As we saw in a previous post, those jaws are attached to a fairly monstrous looking little critter. But this is just the antlion in its baby form. 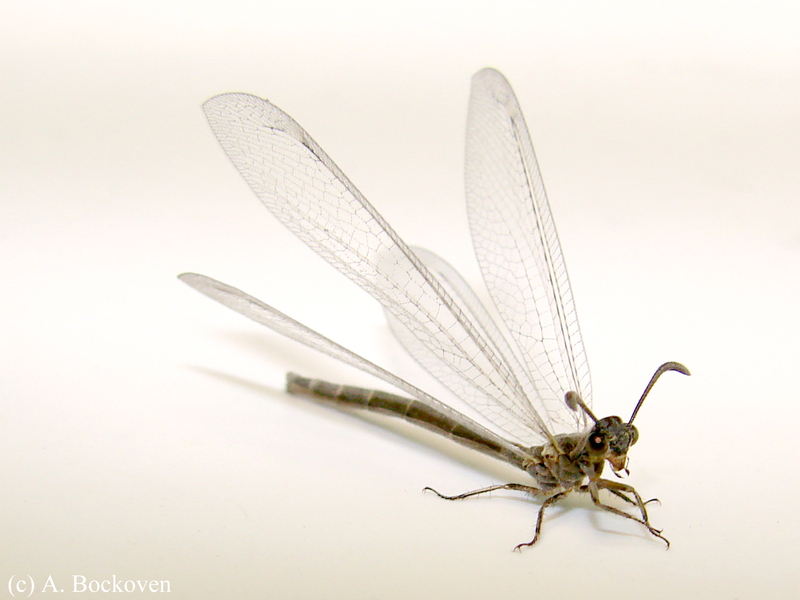 Very few people would connect the juvenile to the fluttery damselfly-like adult seen in the picture above. Antlions, like lacewings, belong to the order Neuroptera (literally “nerve-winged”) so named for the intricate venation of the wings of the adults. Also like lacewings, both the larvae and the adults are predatory, albeit with very different strategies. Lacewings are primarily nocturnal, and somewhat weak, fluttery fliers–a trait very different from the fleet agile damselflies they resemble. 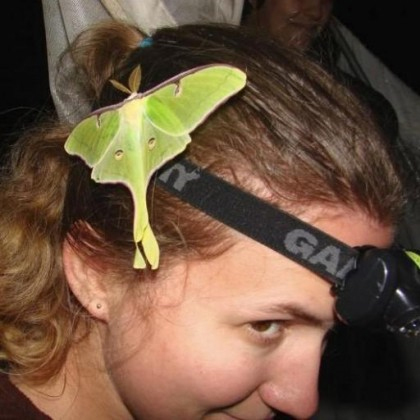 However both are ferocious predators in the insect world, despite their delicate appearance. Close up of the head of an adult antlion. Lacewings can be distinguished from damsel and dragonflies by several characteristics. Their petal-like wings lack a “nodus” or kink at the top margin that is present in both damsel and dragonflies. 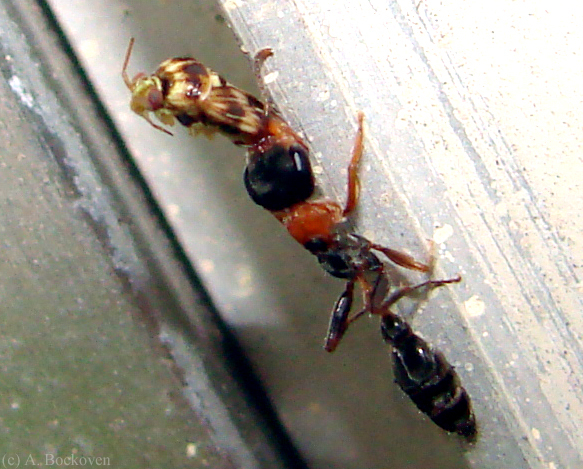 A simpler trait for the layperson is the presence of prominent clubbed antennae. 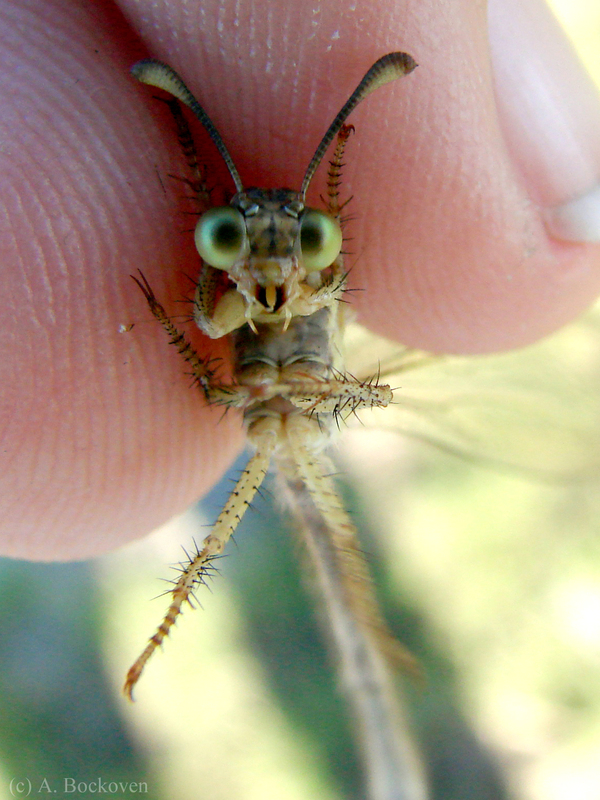 Damsel and dragonflies have very small, hardly noticeable antennae, whereas owlflies (a close relative of the antlion) have antennae longer than the length of their body. Like other neuropterans, antlion larvae have large specialized sucking jaws, which they lose in their adult for for more typical mandibles (compare the above and below pictures). 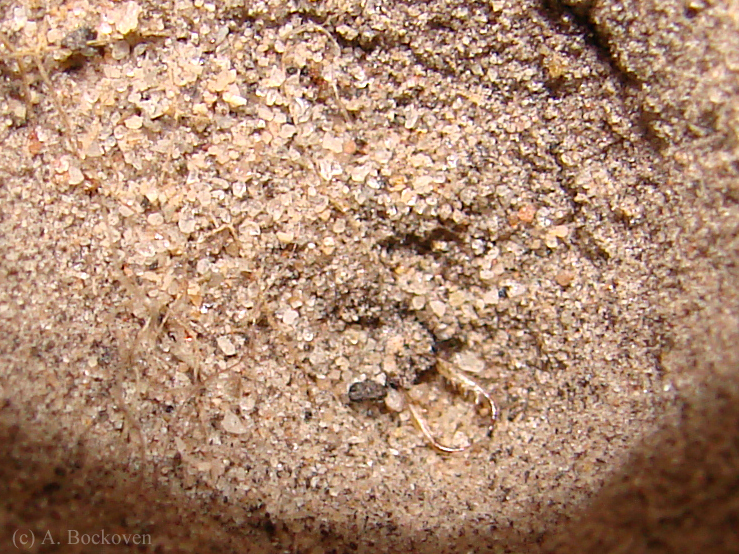 The head and jaws of an immature antlion are visible lurking at the bottom of its sand pit. Adult antlion spreading its wings. Antlions actually make interesting pets. They can be kept in a dish of deep sand and the only upkeep they require is an ant or other small insect dropped in once or twice a day. It’s fun to watch their pit building behavior, and you can even keep a few in a large dish and watch them establish territories. Eventually, they will pupate, weaving their cocoon underground and forming a small ball of sand around themselves. At this point a perch and a cover of some sort (I used plastic wrap tented over a stick) are necessary to trap the emerging adult and allow it to inflate and dry its wings properly. An antlion larvae removed from its pit. 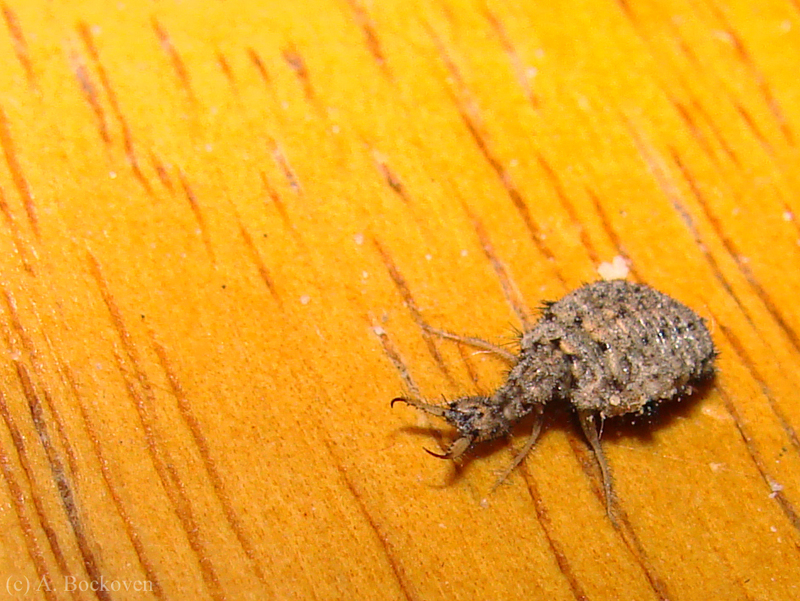 An antlion larvae, viewed up close, is a truly creepy little critter. It is one of those horror movie-esque predators that makes me very glad I am not insect-sized. If you remember the pit monster from the original Star Wars movies you have some idea what these guys are all about. Antlion larvae are famous for the conical pit traps they build to catch their prey. 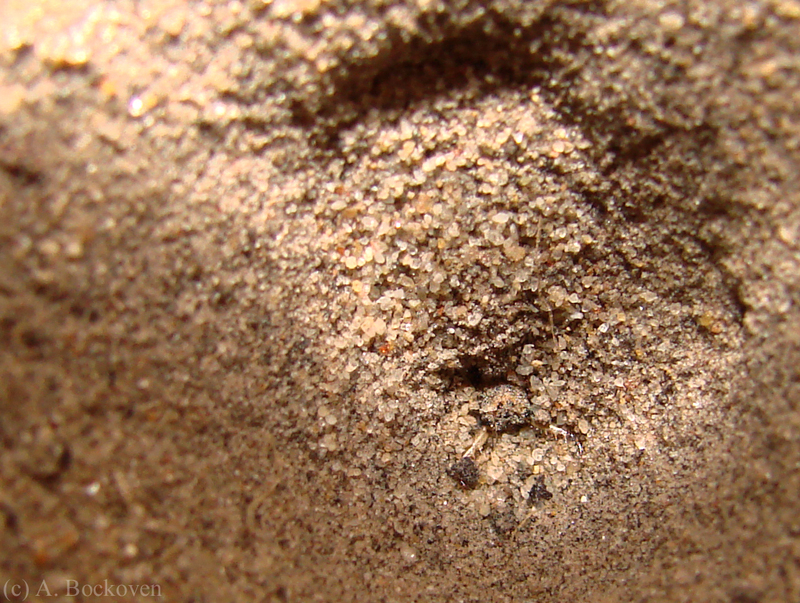 The antlion larvae finds a fine, sandy soil and moves in backwards circles, burrowing down and flicking sand up to create a funnel above it. (In fact, pit-building antlions have adapted to a point where they can no longer move forwards.) The antlion larvae lurks at the base of the pit, ready to grab any small critters that fall down the slippery sides of the pit and become entrapped. The antlion will also use its head to toss sand at any escaping prey, further collapsing the walls of the pit, and bringing the prey sliding down. The head and jaws of an antlion larvae lurking in its sand pit. 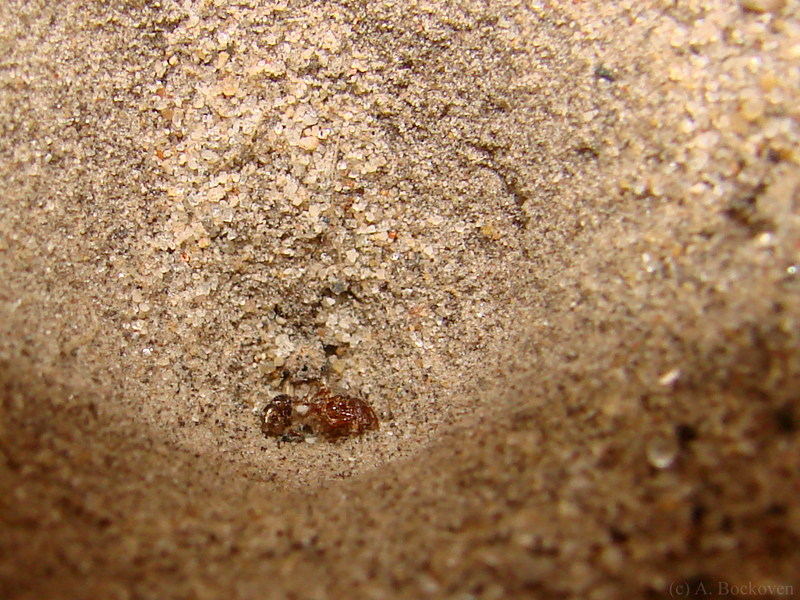 An antlion larvae catching a fire ant in its pit. Come back next week to see the adult antlion! 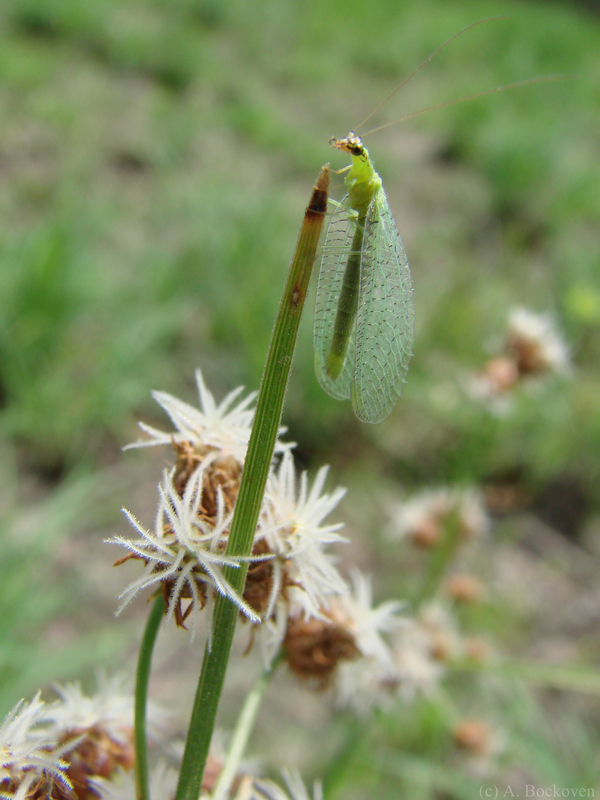 A green lacewing perches on a flower stem. I caught this little guy right before he took off from the tip of a flower stem. Lacewings are members of order Neuroptera,which includes both green and brown lacewings mantispids (mantisflies), and antlions. Neuroptera means ‘nerve-winged,’ in reference to the intricate venation of the members’ wings. They are closely related to, and are sometimes classified with, the orders Megaloptera and Raphidioptera, the dobsonflies, fishflies, and serpentflies, all of which also share similarly complex wing venation. The green lacewing family, Chrysopidae, takes its name from the greek word “chryso” for “gold” for the nearly metallic toned eyes were are often conspicuously golden. The macrophotography blog Four Ages of the Sand has a gorgeous close up of a lacewing eye. Somewhat like dragonflies, lacewings and other neuropterans are predatory, both as larvae and adults. Because of this they are popular for pest control, and eggs are often purchased and distributed in large quantities in greenhouses or agricultural fields. On the other hand, in some situations this same quality may make them a pest insect themselves. For instance, some scale insects are used for commercial red dyes, and lacewings may prey on farmed populations of these insects.